This week included the Cinco de Mayo, the anniversary of the overwhelming (and surprising) Mexican victory over a superior French force at the Battle of Puebla, but used mostly as an excuse for Mexican expatriates and non-Mexicans to celebrate Mexican culture. And food. Mostly food. 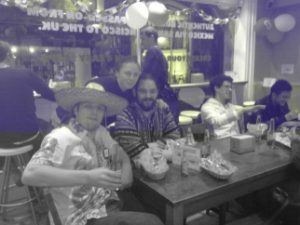 To mark the occasion, one of my favourite restaurants, The Mission in Oxford, announced that they were giving away free beer to customers, and your next burrito free if you came along dressed as a Mexican. 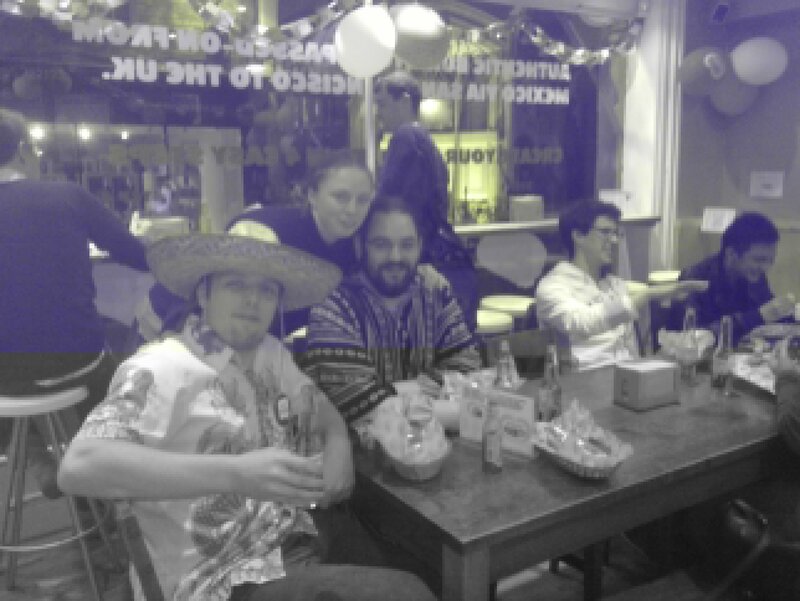 The Mission already wins my favour by making the best burritos I’ve ever tasted; giving me an excuse to dress up and get free beer and more burritos is just a bonus! Dan with Ruth and JTA at The Mission. We’d had a long, long day already. After work, I’d mostly been doing administrative work with helpline Oxford Friend, with whom I’m a volunteer. Ruth and JTA had perhaps been even busier, as they’d spent the evening working on the Yes to AV telephone lines, making sure that everybody who had pledged to vote was out and doing so. We all really felt like we’d earned our burritos. So we donned our ponchos and (in my case) my sombrero, and went to The Mission. The Mission remains awesome. If you’re looking for food in Oxford, I highly recommend them. And no, they’re not paying me to say this. It’s really, really hard to cycle while wearing a sombrero. Those things catch the wind like nothing else, and unless you enjoy riding along with what feels like a kite tied to your neck (and that’s if you’re lucky enough that the neck string catches you; otherwise your hat flies off into traffic and you have to run after it, yelling and screaming), cycling while wearing one is not a good combination. We brought home a takeaway for Paul, too, which I suspect was his second burrito of the day. Seriously: nobody celebrates Cinco de Mayo like Paul does.